Thank you! 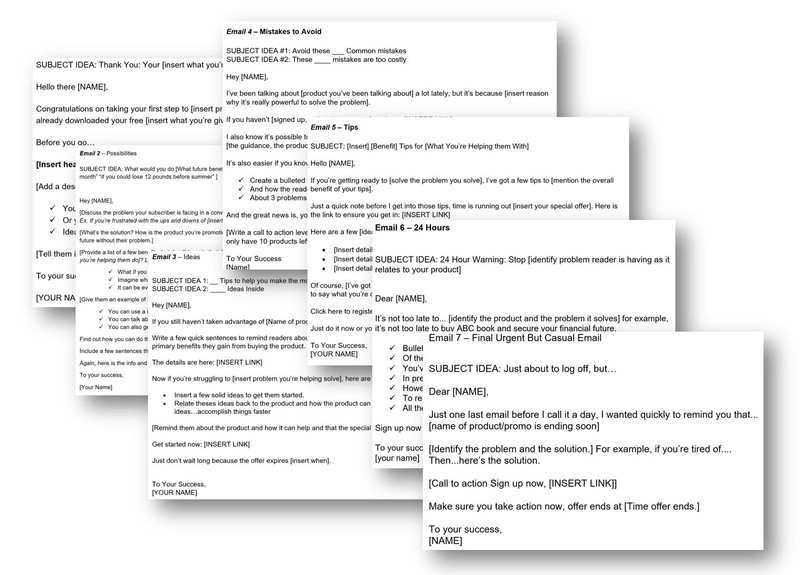 Your Bigger More Responsive Email List Ecourse has been emailed to you. Thanks for picking up your 4 Weeks to a Bigger, More Responsive Email List Ecourse. We have emailed your access information to you, but before that, we'd love to give you an opportunity for more great content. It's 2 Instant Product Funnels and a Follow-Up Campaign that will allow you to create a quick product for sale (or two! ), done for you, with a make-it-yourself value of $6,950 for just $67. 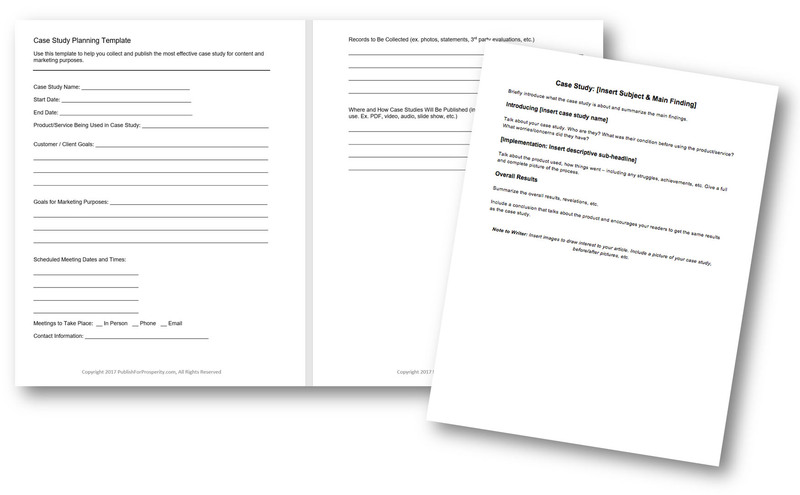 2 Packages with TONS of Practical Fill-in-the-Blank Templates to accompany the ecourse. From creating their opt-in offer and making videos to promote their opt-in offer…all the way to following up with subscribers, these templates have your customers covered. 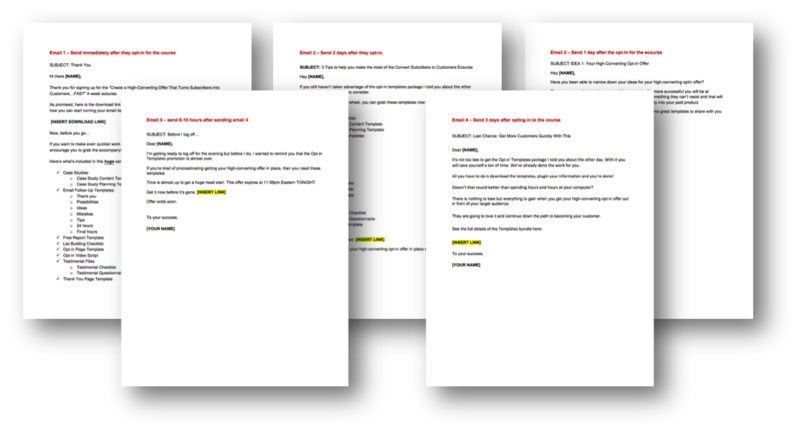 2 Ready-to-Publish Sales Pages to promote each set of templates as a full product. These come in in .doc format and ready-to-paste WordPress code. 2 Promotional Product Graphics (PNG): So you can promote the templates on social media, through your blog and more. 2 x 5-Part Email series to Promote Your Products: Once they've opted into the ecourse you just purchased, use these 5-part email series to turn them into paying customers. 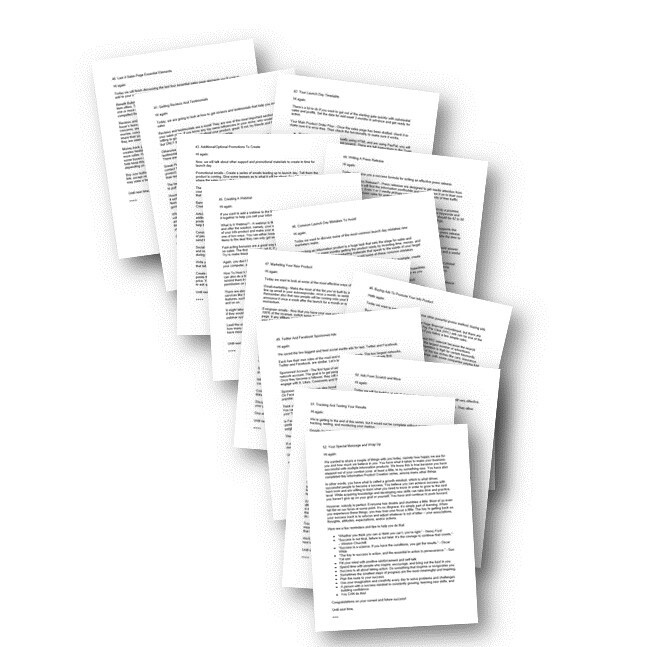 These emails are in .doc format. Bonus! You also get 52 autoresponder emails with over 18,000 words, so you can continue delivering value all year long to your readers. List Building Checklist: Make sure your customers stay on task and don't miss any steps in growing their list that turns subscribers into customers quickly. Opt-in Page Template: Here's a handy landing page template that is proven to convert visitors into subscribers. 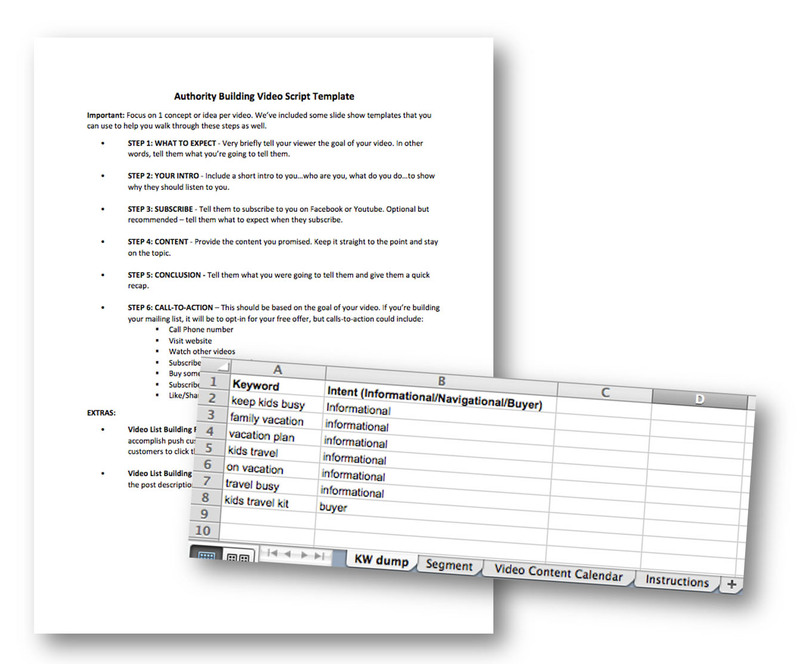 Opt-in Video Script: Help your customers boost their opt-in conversions with this handy script, making it easy to add a personalized video to their landing page. Thank You Page Template: A thank you page, needn't be complicated, but it needs some key elements to ensure more subscribers become customers fast. This template shows them how. 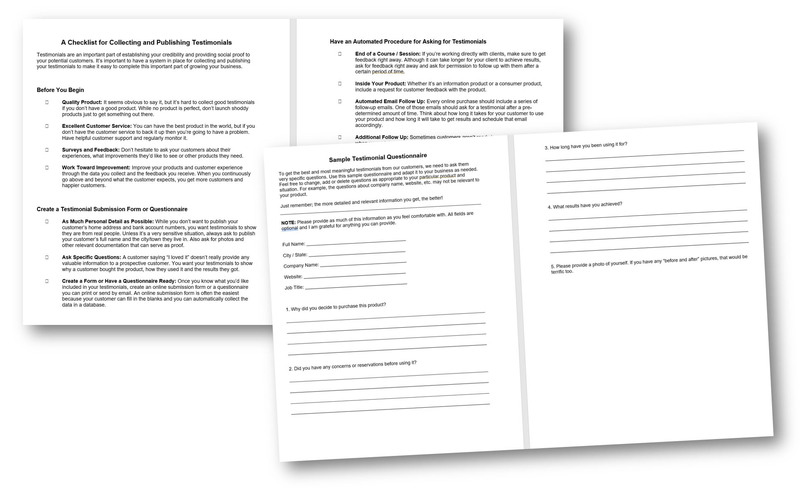 Free Report Template: A free report should directly align with a hard-to-resist product offer. This template makes it easy for your customers to make an interesting report that sells their product for them. This proven email series is fill-in-the-blank and ready to use. It includes 7 informative emails designed to help the recipient make a smart buying decision. One of the best ways to build subscriber confidence is to share testimonials from satisfied subscribers and customers. But not all testimonials are built the same. You get the following to share with your customers, so they can collect and publish the best testimonials possible. Case studies are another great way to generate social proof, which means more subscribers will turn into customers. 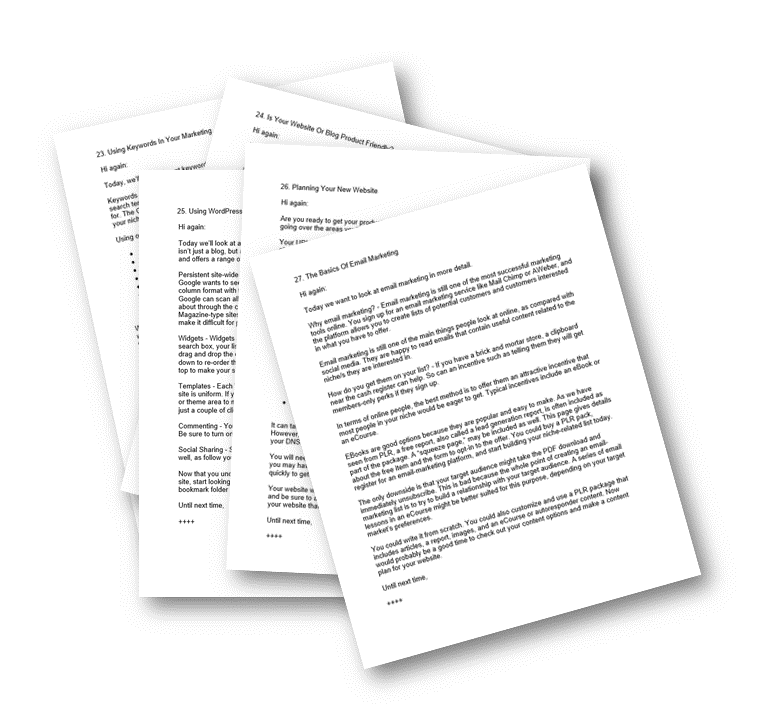 We've included what your customers need to develop solid case studies for marketing purposes. There's a subtle art to quickly educating or entertaining viewers through video and then getting them interested in an opt-in offer. 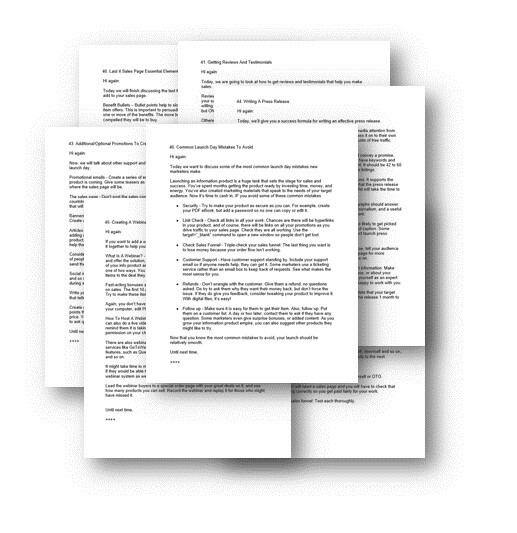 This video script template ensures your customers have all the right elements in their script to do just that. This handy calendar makes it easy for your customers to plan their videos, grow their traffic and track their results. Make it easy for your customers to quickly create high-value videos that are designed to turn the viewer into a subscriber quickly. 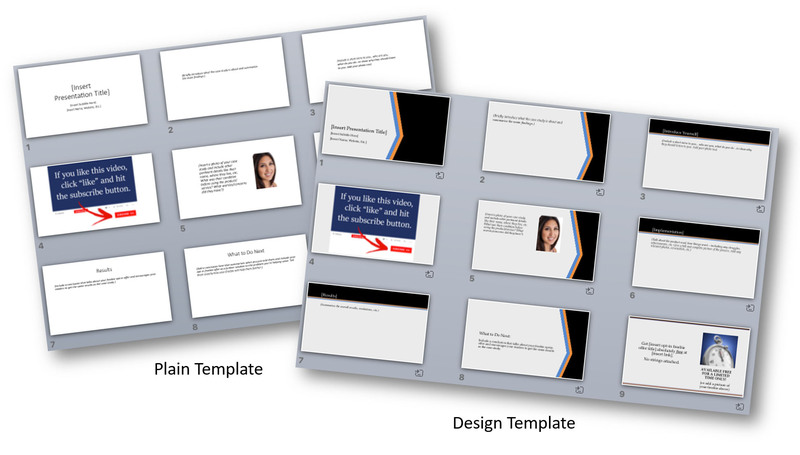 You get two versions of each template…one plain and one with professional template design. Case Study Video Template: This template helps build quick social proof so that more viewers will want to opt-in to your customers list right away. “How to” Video Template: A template for demonstrating how to do something. Informative content builds authority and authority builds lists. Myth Buster Video Template: Help your customers set themselves apart from the competition by dispelling common myths in their niche. Product Review Template: Searches for product review content are HUGE. Make it easy for your customers to create product reviews that bring them more subscribers too. Recipe Video Template: Recipes are always a big hit on video sites. This template makes it easy to share a recipe and bring the viewer back to opt-in to your customer's list. Keep your customers in content creation mode with these extra slide show templates that make it easy to create compelling and action-oriented videos. 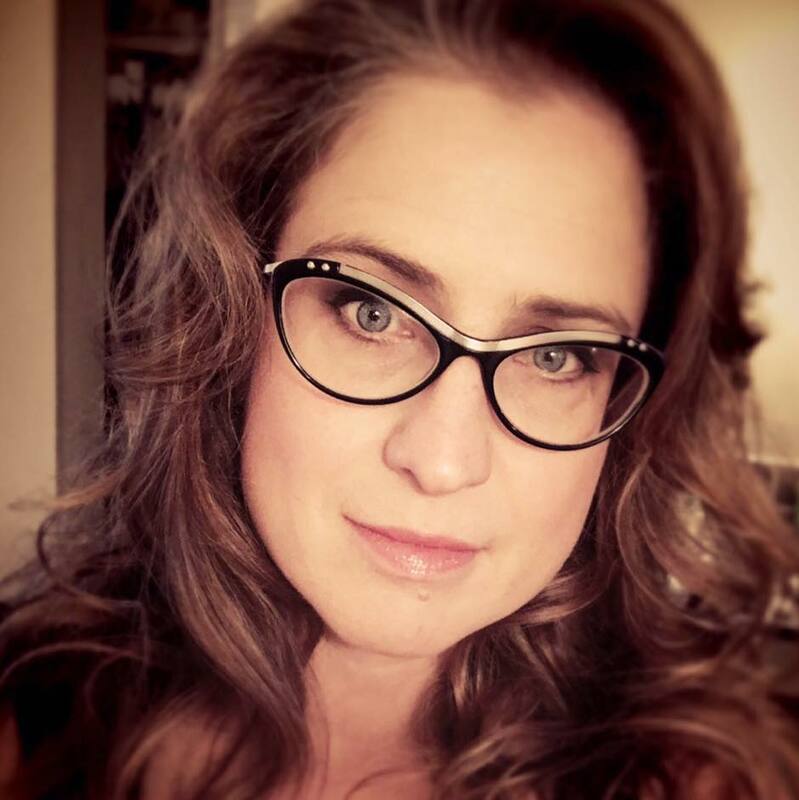 Event Invitation: Promote a webinar, free online event, in-person event, etc. Interview: Add some visuals to an informative interview. Testimonial Compilation: Let your customers display feedback from some of their most satisfied customers. Video Testimonial: People want to hear about others who have tried the products and services they're considering. 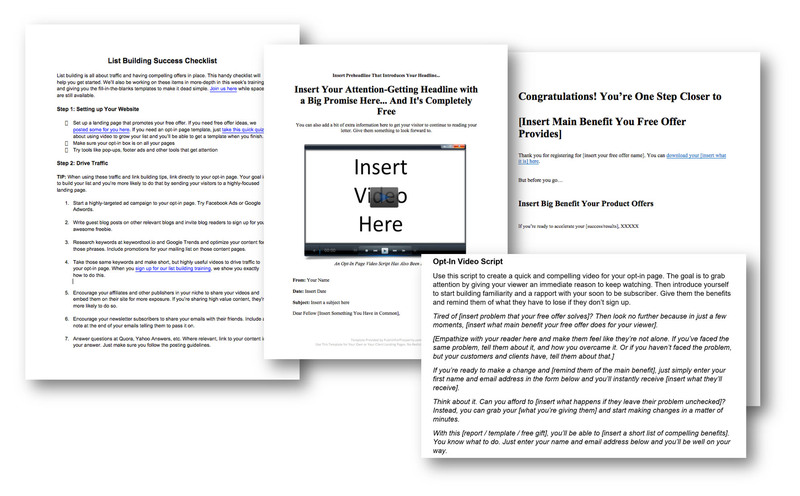 This template makes it easy to showcase a video testimonial. 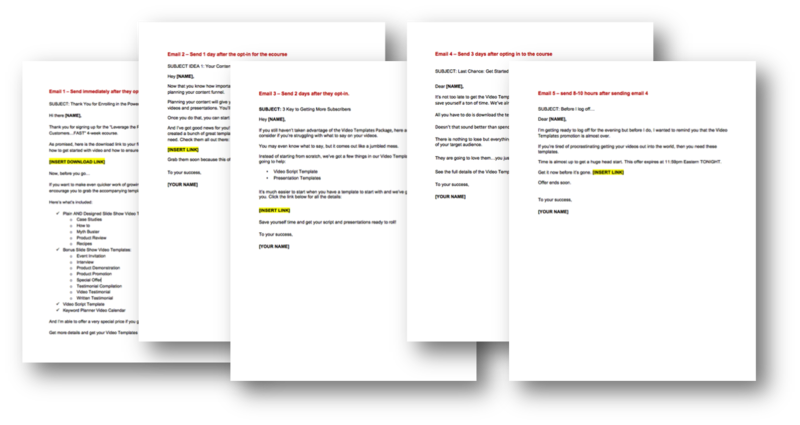 Written Testimonial: Much like the above template, this one allows your customer to showcase their written testimonials. 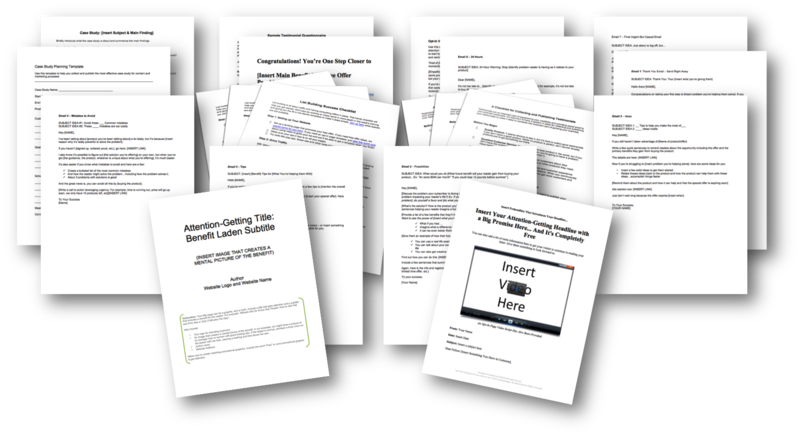 Load these promotional emails into your autoresponder to stay in touch after someone opts-in for your free ecourse and convince them to buy the templates. To make it easy for you to add an upsell to the ecourse with the templates we provide in this bundle, we've included the sales page copy…and even created the WordPress-ready code for you. We even host the images for you! Just fill in the blanks with your own information, order button and you're ready to roll. Use the graphics for your sales pages, social media, blog or wherever you publish content. They're a visual representation of all the awesome templates you have to offer! You also get 52 autoresponder emails with over 18,000 words, so you can continue delivering value all year long to your readers. This series is all about how to get started creating information products. Add your product promotions, affiliate recommendations and more. Use these 52 pieces of high-value content for your autoresponder…or put them together into a report, use for social media content or even for your blog. It's all up to you! We've included everything you need to turn these templates into quick products for sale and even threw in the marketing materials to make it dead simple. 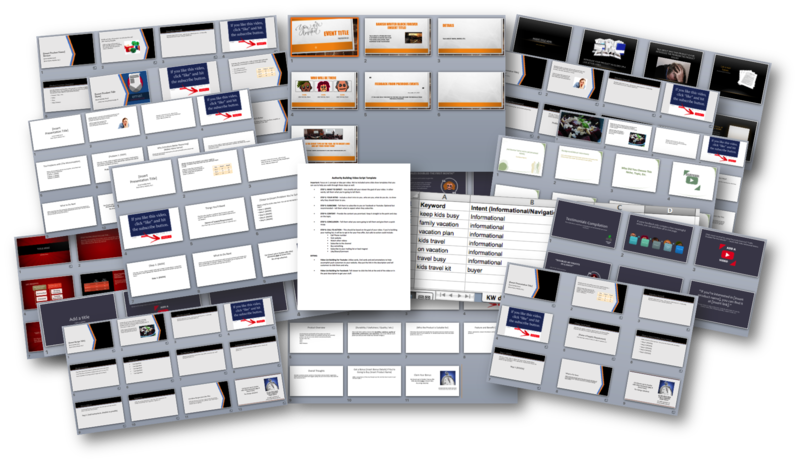 At only $67 ($6,950 value) for your PLR license, so you can save endless hours of time and plenty of money to provide your readers with the information they’re looking for.